Was the Great Recession a Return to Trend? 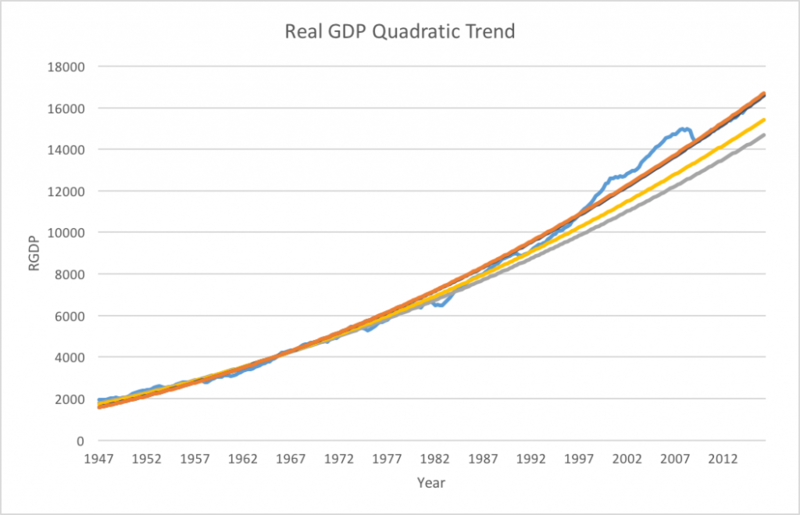 From these graphs, it appears that assuming quadratic growth, which implies a decreasing growth rate over time, would have done much better in predicting future GDP. 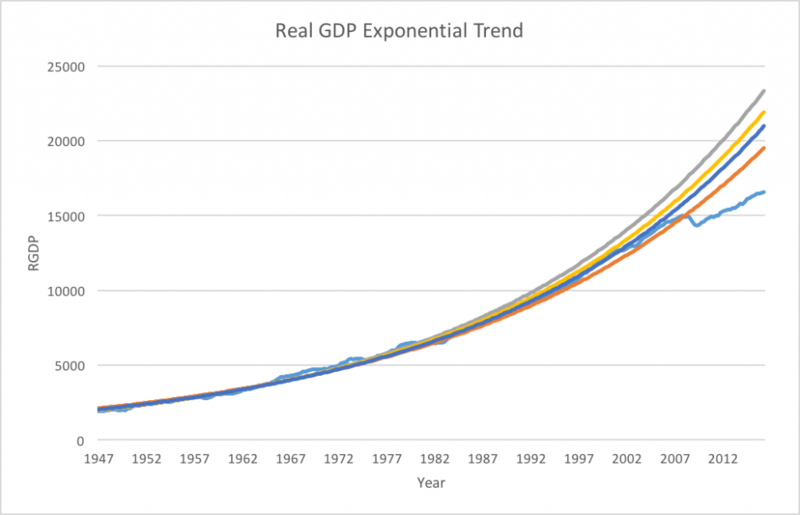 Notice especially how close a GDP prediction would have been by simply extrapolating the quadratic trend forward by 10 years in 2006. Had the economy stayed on its 2006 trend through the present, RGDP in the last quarter would have been $16.583 trillion. It was actually $16.525 trillion for a difference of about $58 billion (off by 3 tenths of a percent). That is an astonishingly good prediction for a ten year ahead forecast (Just for fun, extending the present trend to 2026 Q2 predicts $20.200 trillion. Place your bets now). Of course, this analysis doesn’t prove anything. 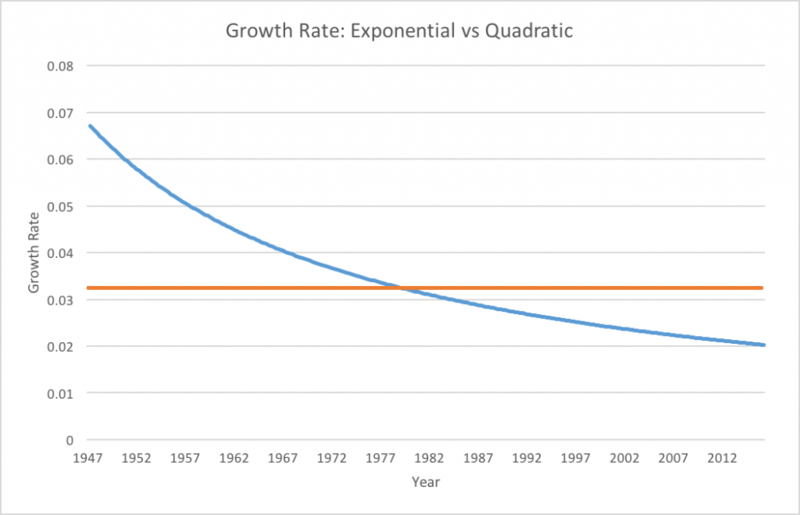 It could just be a coincidence that the quadratic growth theory happens to fit better than the exponential. But I think it does show that we need to be careful in interpreting the Great Recession. Using the above pictures, I can come up with two plausible stories. In the first, the Great Recession represents a significant deviation from trend. There was no fundamental reason why we needed to leave the path we were on in 2006 and we should do everything we can to try to get back to that path. Whether that comes through demand side monetary or fiscal stimulus or supply side reforms like cutting regulation and government intervention I will leave aside. But we should do something. The other story is a bit more pessimistic. 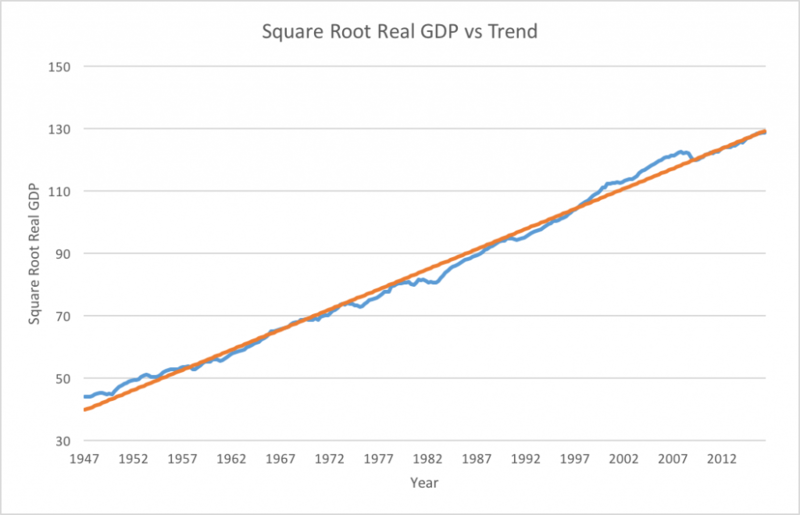 In this version, economic growth had been trending downwards for decades. We made a valiant effort to prop up growth on the strength of the internet in the late 1990s and housing in the early 2000s. But these gains were illusory, generated by unsustainable bubbles waiting to be popped rather than true economic progress. The recession, far from an unnecessary catastrophe, was an essential correction required for the economy to reorganize resources and adapt to the low growth reality. Enacting policies that attempt to restore previous growth rates will only fuel new bubbles to replace the old ones, paving the way for future recessions. Doing something will only make things worse. Which story is more plausible? I wish I knew. 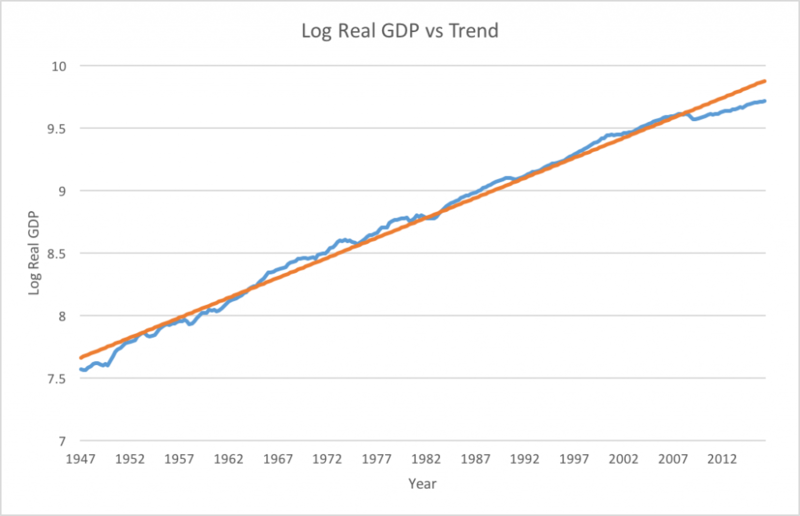 Author Chris SurroPosted on September 12, 2016 Categories EconomicsTags Growth, MacroeconomicsLeave a comment on Was the Great Recession a Return to Trend?